Make sure the rifle is unloaded. Remove the front and rear action screws, trigger guard and floor plate assembly, and internal magazine box. Replace the trigger guard/ floor plate assembly with the detachable magazine trigger guard assembly. Reinstall the action screws and tighten. Insert an unloaded magazine into the well and push up until it locks in place. To remove the magazine, push the latch button inside the trigger guard forward. This will unlatch the magazine allowing it to fall free from the rifle. After magazine locks into place, the latch button is hard to push forward to unlatch the magazine. The cause of this problem is that the rear pillar height of the stock is too short. When the latch button is pushed forward, the magazine raises slightly before being unlatched. If the pillar height is too short, during unlatching the magazine binds against the bottom of the receiver rails. Remedy: Install 1 or 2 shim washers (included with unit) between the trigger guard assembly and stock at the rear action screw. This will increase the height of the pillar area. When the new trigger guard is installed, my front action screw hits the bolt lug and binds the bolt. This problem is caused by the front pillar height being too short. Remedy: Shorten the front action screw or place a shim washer (included with unit) between the trigger guard assembly and stock at front action screw. Once the loaded magazine is inserted, the bolt overrides the cartridge or picks it up just ahead of the rim. This problem is caused by the rear pillar height being too long. 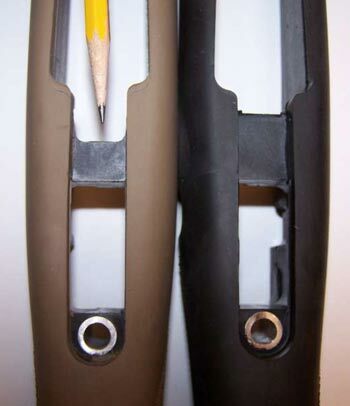 If too long, it allows the magazine to sit too low in relation to the bolt face. Remedy: Inlet the trigger guard assembly deeper into the stock. This will raise the magazine up to its proper position. When feeding a cartridge out of the magazine, the nose of the projectile dips down and hits the bottom of the feed ramp. This is caused by the front pillar height being too long. If the front pillar height is too long, the magazine is sitting too low in relation to the feed ramp of the receiver. Remedy: Inlet the trigger guard assembly deeper into the stock. When properly placed without a magazine, the radius of the front, top of the trigger guard assembly should only be approximately .025” below the receiver body. Magazines fit loosely and rattle. 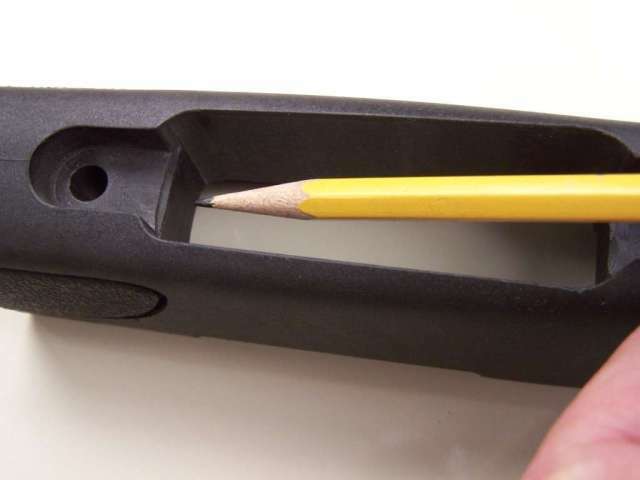 These problems are caused by the tolerances being open enough for the magazine to drop free when unlatched and being unloaded. We originally manufactured the magazine/mag well tolerances somewhat tighter, but then had some mags that didn’t want to fall free when unlatched. Operators using our units in combat preferred that we open the tolerances so a magazine change was trouble free. So we opened the tolerances. The unit will rattle somewhat if an empty magazine is in place. The only spring tension on the magazine in this case is applied by the latch. But, once a magazine is loaded, the top round applies pressure to the bottom of the bolt omitting the rattle. When I install the new system and tighten the front action screw, the rear of the trigger guard pops out of the stock. This is caused by the inlet on the bottom of the stock not being on the correct plane to the receiver body. Remedy: If not too far off, installing a shim washer or two can correct the problem. If not, then glass bedding the stock is the best option to get a correct fit. When using a wood or plastic Rem. stock, it may be necessary to relieve the front of the magazine well as shown in the picture below to allow the trigger guard to sit in the correct position. This is noticeable if there is a gap between the front tang of the trigger guard and the inletted portion of the stock. If the cartridges are nosediving into the front of the magazine while feeding, this is generally caused by the trigger guard assembly sitting too far from the the receiver. As the bolt nose picks up the rim of the case, if the rim is too low, this creates a fulcrum which allows the cartridge to pivot down in front. The procedure to fix this is to inlet the trigger guard deeper into the stock. No shim washers should be used in this case. This system was designed around the Remington M-700 platform. The correct pillar height for the M-700 should be .735” at the front pillar and 1.250” at the rear. We see quite a few aftermarket stocks that have an incorrect pillar height, thus the need to send shim washers with our units. While the incorrect pillar height normally will not affect feeding when using the factory hinged floor plate units, it adversely affects the detachable magazine systems. This is due to the fact that in a factory system the cartridge feeds off of the rails of the receiver. With a magazine fed system, the placement of the magazine is critical for proper feeding. The top of the new trigger guard assembly should be kept relatively parallel to the receiver body. Installing the shim washers is the easiest way to remedy the problem of short pillar height as long as the shims are placed between the trigger guard assembly and the stock. Installing anything between the receiver body and stock other than glassing compound, will be detrimental to accuracy. The best solution would be to glass bed the stock making any needed corrections to the pillar height at that time. Wyatt’s DetMag® system is designed to be a near drop-in replacement for Howa 1500 and Weatherby Vanguard short action bottom metal. Due to changes through the years of stock designs, some minor alterations will need to be made to the stock for the install. First, check to make sure the gun is not loaded. Remove the front and rear trigger guard screws. Remove the trigger guard assembly and internal magazine box. The front of the web of stock material between the trigger guard and magazine well will need to be removed approximately .375” back toward the trigger to clear the new trigger guard. (See picture below)Tan stock is altered, black stock is factory. Replace these items with the DetMag system, reinsert front and rear guard screws and tighten. After installation, insert a magazine to check for latching. If the magazine fails to latch or unlatch, a shim washer may be needed between the trigger guard assembly and the stock. These shim washers are available at hardware stores. The pillar lengths should be .650” for the front and 1.100” for the rear. On .223 models, it will be necessary to shorten the bolt stop about 1/2″.